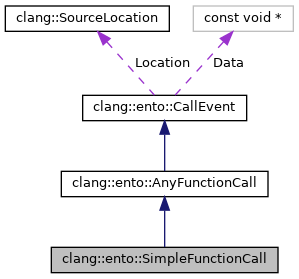 Represents a C function or static C++ member function call. Definition at line 527 of file CallEvent.h. Definition at line 531 of file CallEvent.h. Definition at line 555 of file CallEvent.h. Copies this CallEvent, with vtable intact, into a new block of memory. Definition at line 536 of file CallEvent.h. Returns the expression associated with a given argument. May be null if this expression does not appear in the source. Definition at line 549 of file CallEvent.h. 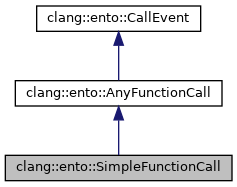 Definition at line 646 of file CallEvent.cpp. References clang::ento::SVal::getAsFunctionDecl(), clang::ento::CallEvent::getOriginExpr(), and clang::ento::CallEvent::getSVal(). Definition at line 553 of file CallEvent.h. Note that this may be greater than the number of parameters in the callee's declaration, and that it may include arguments not written in the source. Definition at line 547 of file CallEvent.h. Definition at line 541 of file CallEvent.h. Definition at line 528 of file CallEvent.h.